Rosevere in Bintree, near Fakenham sleeps 8 people. 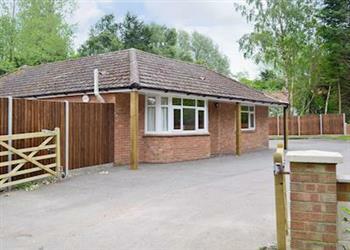 Rosevere near Fakenham is a detached bungalow which offers spacious holiday accommodation and has its own hot tub and heated indoor swimming pool. The swimming pool is 10ft from the house and has a shower room with toilet. The stunning North Norfolk coastline lies just 15 miles north, much of which is classified as an Area of Outstanding Natural Beauty, with its amazing sandy beaches, RSPB nature reserves, coastal path and pretty villages with many gastro pubs. Rosevere has plenty of attractions nearby for all the family to be entertained for days, including Pensthorpe Natural Reserve and Gardens, 6 miles, the picturesque Georgian town of Holy is only 12 miles away and the bustling market town of Fakenham, 8½ miles away. Visit the medieval city of Norwich, 17 miles, which is a great day out for all the family with excellent shopping, the castle museum, art galleries, theatre, cathedral, fine restaurants pubs and cafes. Located just 26 miles away is the Royal Sandringham Estate, with its garden and museum. Other places of interest and worth a mention are Weston Longville Dinosaur Park, Langham Glass in Fakenham, and Holkham Hall. If you like to be outdoors, then why not go along the coastline where you will be able to take part in excellent sailing and water sport activities. Or with fantastic walking and cycling opportunities from the doorstep and quiet country lanes, designated paths and trails surrounded by wonderful views over undulating countryside, making Rosevere every outdoor enthusiasts dream. The beaches of the North Norfolk coast are 15 miles. With the shop 2¼ mile, and a pub &: restaurant 300 yards from Rosevere near Fakenham. Rosevere is all on the ground floor. Oil central heating, electricity, bed linen, towels and Wi-Fi included. Welcome pack. Enclosed lawned garden with sitting-out area and garden furniture. Hot tub for 5. Heated indoor swimming pool (9.1m x 4.4m, depth 1m) with shower room and toilet. Private parking for 4 cars. No smoking. Please note: The covered swimming pool is 10ft from the house. Holidays at Rosevere run from Friday to Friday. For a better idea of where Rosevere is, you can see Rosevere on the map below. Rosevere is in Norfolk; should you be on the lookout for a special offer, you can find all the special offers in Norfolk. It's always worth checking to see what is on offer at the moment. Do you want to holiday near Rosevere (UKC504), you can see other cottages within 25 miles of Rosevere; have a look to find your perfect holiday location.